I first met my friend Tina in 1996, when the National Science Foundation decided to give me money to do some predoctoral research in Oregon. I needed a place to stay for the summer, so I looked up the University of Oregon student newspaper’s classified ads online and found an ad for a sublet. The person who placed the ad, Jeff, was himself going to be doing predoctoral research that summer, but in the South. * He said, “I think you’re fine, but my housemate, Tina, is the one who’s going to have to live with you, so you’ll need to talk with her, too.” I did, and we hit it off just fine. When I drove out there by myself a few months later and arrived at her house, a yellow house with pink trim (next door to a pink house with yellow trim) in the Whiteaker neighborhood in Eugene, the first thing I saw as I walked through the wide-open front door were two kids jumping on the sofa in the front room. One looked about five years old, and the other looked to be around three. She came downstairs, introduced the kids (who lived next door)**, showed me around, and then was off on her bike to her West African dance troupe practice. She was a fabulous roommate, and we had a great summer together. We kept in touch, and a few years later–when I was back in Oregon for a year-long stay to do my doctoral fieldwork–I visited her in Portland (where she’d move to pursue a graduate degree in social work), and she visited me in southern Oregon (where we hiked to the summit of Humbug Mountain and created huge sculptures on Lighthouse Beach with driftwood, seaweed, and other stuff washed up by the sea). Since I left Oregon, we’ve still kept in touch through lots of changes: my cross-country moves, her four-mouth solo backpacking trip through Latin America, my marriage and the birth of Sylvia. A couple of years ago, she fell madly in love with an Irishman named Kevin, and last year they got engaged. In August, they were married at an organic farm in Hood River, and though I very much wanted to be there, time and money just wouldn’t permit it. I wanted to give them something handmade as a wedding gift, and my first thought was to knit something lacey–perhaps a table runner or picture-frame mat (like the ones in Melanie Falick’s Handknit Holidays . I tried it a few times but found that the tiny needles and wispy yarn were just not my cup of tea. I have no inner lace knitter (at least not now–maybe one day, though…). So I gave the lace yarn to a friend who is a lace knitter and starting thinking about other possibilities. 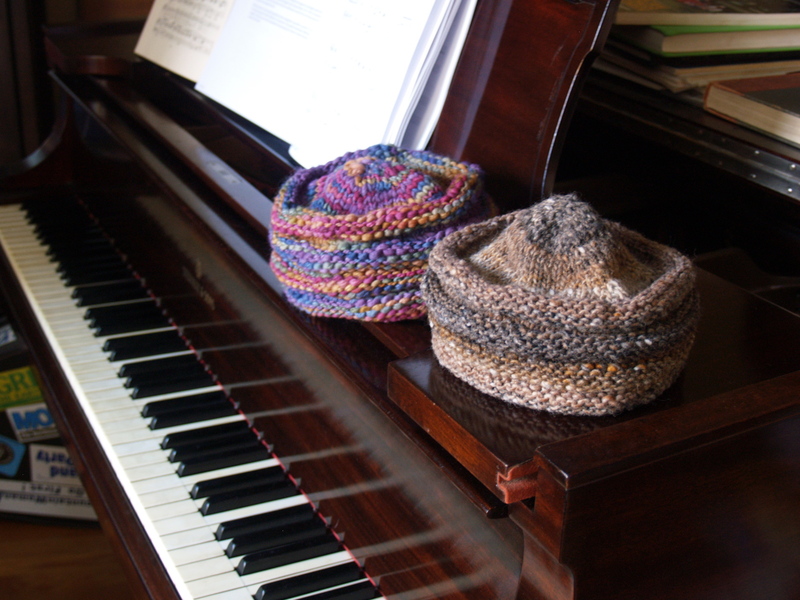 After much deliberation I finally settled on matching-but-not hats: a duo knit in the same pattern but of different yarns. (It seemed a fitting comment on marriage as the union of two distinct individuals.) For hers I used Loran’s Laces Revelation, and his was made of Noro Kureyon–both lovely yarns to work with, made of wool that will keep their heads warm during cold-weather excursions into the Oregon wilderness. I used the Valerye pattern in Cathy Carron’s Hip Knit Hats ; if you click the link, you can see the original hat in brown and black on the cover. The yarns I chose knit up tighter, though, so the resulting hats are a bit shorter and less droopy than the original. ** Those kids were pretty sweet. I saw a lot of them that summer, as they loved to play in my garden. I also saw a lot of them in that they often liked to run around naked. Lovely hats! I am always amazed at how small a world it is, too. Six degrees of separation – must be real. What a fun memory! And a great way to make a new friend. Homemade gifts, especially for something as precious as a new marriage, are always the best! I love the hats! Great yarn choices, too! ;) I *knew* the Revelation had a purpose somewhere.